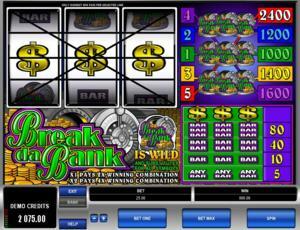 Break da Bank is a popular classic online video slot game from Microgaming that has been released in November 1999. This online video slot machine game has 3 reels and 5 pay lines. The theme of Break da Bank is all about the wonderful feeling of winning a lot of money (especially if you won it in a game of chance)! Numerous online slot players love playing this highly-popular classic slot machine game as it brings out a genuine impression of a real land-based casino slot machine in every way. Break da Bank shows a vault (probably from a bank) which holds a lot of coins. It’s obviously saying that the stakes in this game can go potentially rather high, and it may not be very suitable for low-stakes players because the bets range from $1 up to $125. Most Microgaming online slot games are available in 2 formats. The first format is the one preferred by most players, which is the download format. The second format is the Flash or browser-based version, which means there is no need to download anything at all. Whether you like to download or not, Microgaming has slot games for all your slot gaming needs. Good thing that Break da Bank is available for instant play, so you do not have to download anything to find out if this game interests you enough in a way that you would like to spend some real money on it. In the world of gambling, “breaking the bank” is when a player wins a substantial amount of money from the casino. The extremely rare and accurately literal situation of breaking the bank is when one wins more than the house has on hand. As a colloquial term, “breaking the bank” refers to the act of spending more money beyond one’s means. Well, whatever you understand about this phrase, you should give this slot game a whirl if you love to play classic online slot machine games! If you dream of winning a lot of money while playing a game of chance (be it slots games, bingo, or even the lottery), then you will surely love spending some time playing the Break da Bank online slot game as it features 3 reels and 5 pay lines, no fancy stuff to remember, a wild multiplier symbol that can double or quadruple your payouts, a maximum coin jackpot of 2,400, a maximum cash jackpot of $60,000, and it even has an Autoplay function to make your game play easier and more exciting! The quality of the graphics and sound provided by Microgaming software is without doubt outstanding. They possess a track record of creating the most spectacular graphics and realistic sound effects. A lot of online slot players love Microgaming because its online slot games have smooth animation and amazing yet non-intrusive background music and sound effects. Since it is essentially a no-frills type of slot game, Break da Bank has been designed to have a simple classic slot game with matching sound effects. The casing of the reels includes the reels, buttons and the payout table. The overall graphic design of Break da Bank displays a vault overflowing with gold coins. Colors used in this game include green, purple, gold, blue, red, orange, yellow, black and white. Because it is a fairly simple slot machine game, Break da Bank has no constant background music or sound effects. Whenever you spin the reels, simple sounds common in land-based traditional slot games will be heard; and when you manage to form winning combinations, you will hear the clinking of coins as you get paid out. There are no regular card deck symbols available in the Break da Bank online video slot game. The regular symbols that you will find in the Break da Bank slot game are the 3-Bar, 2-Bar, 1-Bar, and the Dollar Sign. The Wild Symbol is the Break da Bank Logo. It is a wild multiplier symbol. Thus, the Break da Bank wild symbol not only acts as a substitute for all other symbols in order to you help you form winning combinations, but it also can multiply the payout! One Break da Bank Logo wild symbol doubles the payout of a winning combination it completes. Two Break da Bank Logo wild symbols quadruple the payout of a winning combination it completes. Multiple Break da Bank Logo wild symbols on an active pay line create winning combinations (refer to the payout table). Please note that the Break da Bank Logo (wild symbol) winning combination payouts are not multiplied. There is no Scatter Symbol in the Break da Bank online slot game. Since Break da Bank is a traditional, old-school 3-reel slots game, there are no bonus features in this game. Break da Bank has 3 reels where you may bet on 5 pay lines. The minimum bet is 1.00 and the maximum bet is 5.00 per line. You can wager from 1 up to 3 coins per pay line. Thus, the minimum amount you can bet is 1.00 and the maximum amount you can bet is 25.00 per spin. The maximum payout in the regular Break da Bank online slot game is 2,400 coins. Online video slots are much easier and more fun to play when it has an Autoplay function. In Microgaming online slot games, they have 2 game modes – Regular mode and Expert mode. If you would like to play the Break da Bank online video slot game automatically, all you need to do is access the Autoplay function by clicking on the “Expert” button located at the left corner of the game screen. In it, you will find the Autoplay setting that lets you play a desired number of consecutive spins automatically.